Drop forged jaws and differential hardened Teeth and Body of the Jaw enables high torque and high wear resistance of the Jaw Teeth. Handle made from special grade Aluminum Alloy which reduces the weight of the Aluminum Pipe Wrenches by up to 40% as compared to respective sizes of Heavy Duty Pipe Wrenches. The Jaws are Phosphated and the handle is painted to guard against rusting. Exceeds the Torque and quality parameters specified by Federal Specification no. GGG-651 type I Class B and Indian standard 4003 Part II 1986. Ideal for Professionals seeking a Pipe wrench with lighter weight and high torque values. Also good for undersea ship building operations and Aircraft Maintenance. Features :Drop forged jaws and differential hardened Teeth and Body of the Jaw enables hig.. Features :Drop forged jaws and differential hardened Teeth and Body of the Jaw enables high to.. 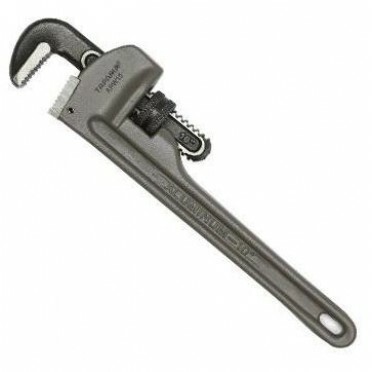 Features :The pipe wrench is an adjustable wrench used for turning soft iron pipes and fittings with..